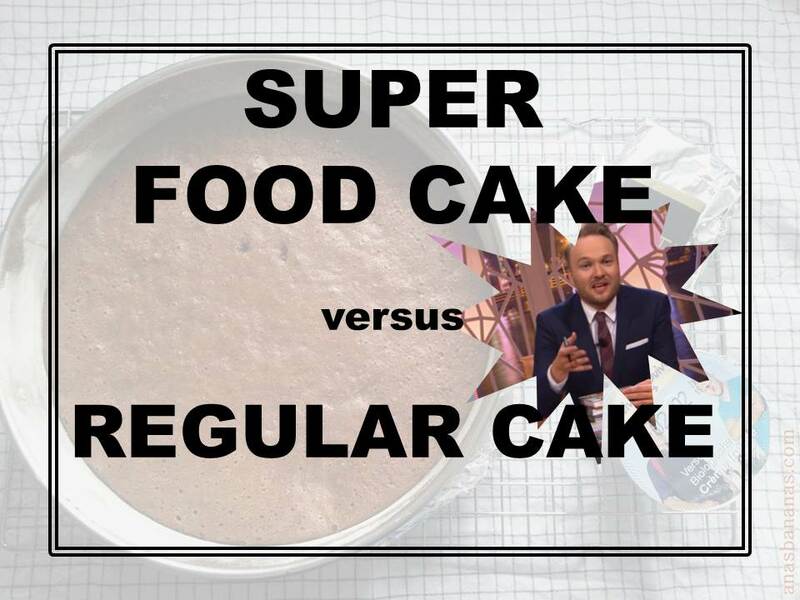 Is supefood cake healthy and good for you? Should you ditch regular chocolate cake once and for all? And how much does a superfood cake actually cost? All these questions and more are answered in this post. Watching Arjen Lubach’s episode (in Dutch) about “The Green Happiness” (two Dutch registered dietitians who might not know what’s good for you after all) was both inspiring and irritating. Inspiring – because someone finally pointed out the fact that lots of individuals who are in no way registered to be telling you about healthy nutrition, are writing and selling books about what you should be eating, while some individuals who are certified are actually giving you bad advice. Irritating – because Lubach sometimes used one-sided arguments, while we are all so desperately in need of transparency and open dialogue about nutrition. One of those one-sided arguments was about the “”Super(food) ice cream cake” (in Dutch “Super(food)ijstaart”). This cake recipe, created by your tyical NRFC (non-registered foodie chick), contains bananas, maple syrup, blueberries, almonds, cashews etcetera (all things a foodie loves). Do all those ingredients come with a lot of calories? Yes. Lubach had too much time on his hands and calculated the amount of calories in this superfood cake. He came up with a grand total of more than 9,000 calories per superfood cake. Yikes! Even if you cut the cake in 12 slices you will still be eating more than 500 calories per slice. That’s a quarter of the calories that you should be eating if your daily activity level is average (and let’s be honest, it is). Still, as long as you don’t end up eating three slices per day, you should manage to not overeat your calories. You can easily have a slice of this cake for breakfast, a salad for lunch and soup for dinner, without ever gaining weight. But, there is another even more important point lurking in this story. Based on the composition of the cake (nuts, lots of fibres, fruits), there are a lot of fibres and a good glycemic index (carb to fibre ratio), which means you’ll definitely be getting the feeling of satiety by the time you finish the first slice, and will soon start feeling too full to have another piece, eventually stopping you from eating 9,000 calories in one go. Phew. On the contrary, this won’t happen if you have a slice of regular cake made with white flour & white sugar. This is because the cake is likely to have no fibres and a high glycemic index. So when you have a slice, you’ll be wanting one more, and another more for when no one’s looking. I went ahead and Googled a random regular chocolate cake recipe. It was a recipe containing all purpose flour, eggs, bit of milk, some butter, sugar and cocoa – and it contains (I calculated this myself): 6,877 calories, which is almost 7,000 calories. That means if you cut the cake in 12 slices, you’ll still be eating more than 500 calories per piece (just like with the Super(food) ice cream cake). Whereas this cake does give you (short-term) energy and calories, it does not provide much fibre and definitely has a high glycemic index (there are 3 cups of sugar in the frosting! ), meaning it will make your blood sugars fluctuate. By the way, blood sugar fluctuation is bad because it can lead to damage of blood vessels – you know, the things in your body that make sure all your cells have a good blood supply – leading to poor circulation and all the complications that come with it. IS SUPERFOOD CAKE BETTER THAN REGULAR CAKE? 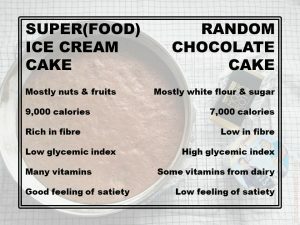 See here for yourself, the superfood cake versus a random chocolate cake (I’ve tried to be as objective as possible, since you know I love chocolate). There is a much bigger problem with superfood cakes – they are unaffordable. The Super(food) ice cream cake in this scenario contains 900 grams almonds, 250 grams cashews, lots of berries, maple syrup (a pricey treat) and some rare superfood powders (maca, vanilla) putting the price of this single cake at roughly 50 EURO. Some would argue that paying extra money on nutrition would save you hundreds of thousands in medical bills in the future. And they may be right. 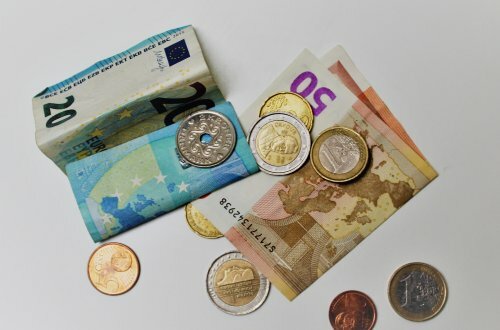 But, if you don’t have 50 EURO (roughly 50 dollars) lying around for a cake, choosing between a random white flour & sugar based chocolate cake and a healthier cake is going to be simple. Superfood cakes can actually be much healthier than regular white flour & sugar based cakes. Superfood cakes often contain nuts, making them nutrient-dense (B vitamins, fibres & healthy fats), as well as making them very high in calories. However, regular white flour & sugar cakes are no different, with frosting alone often containing 1000-3000 calories. Still, regular cakes contain very few nutrients and will probably cause your blood sugars to fluctuate, or cause cravings. No matter how much healthier so-called ‘superfood’ cakes might or might not be, many foodies forget that their cakes are actually unaffordable for most of their readers. Don’t overspend your money on sweets. Spend it on good quality fresh fruits and vegetables, they are worth it. Here is a selection of wonderful sweets you can make yourself (that are also affordable)! P.s. Did you already know you can submit your own recipe here? 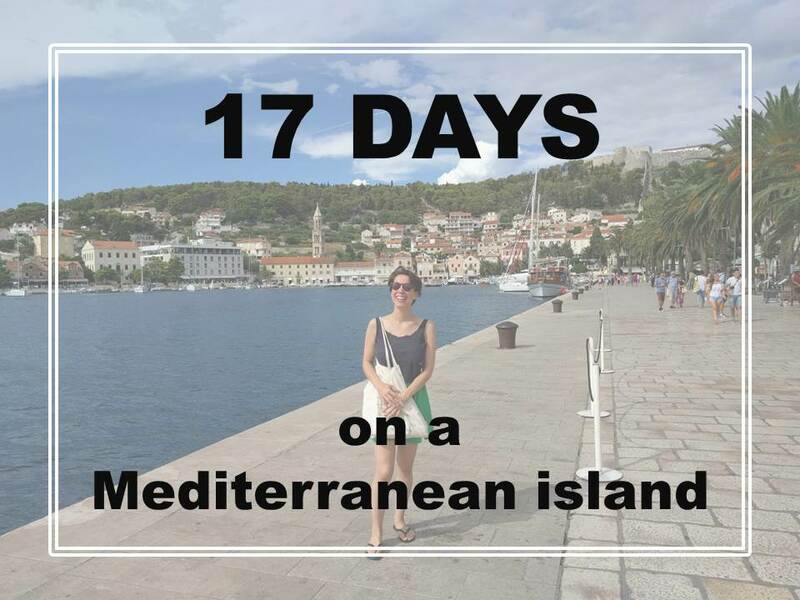 What’s it Like to Spend 17 Days on a Mediterranean island?